Rumors seem to be swirling about what we might expect at Apple’s “It’s Show Time” event on Monday. Today, reports of a possible Apple gaming service turned up again, with the possibility of the service launching as soon as tomorrow. At the same time, Fortnite celebrity gamer/streamer Ninja tweeted something rather curious. The similarities between the Pear in the image and Apple’s logo are obvious. So similar, in fact, that Nickelodeon has used a similar logo to imply Apple products in the show iCarly. 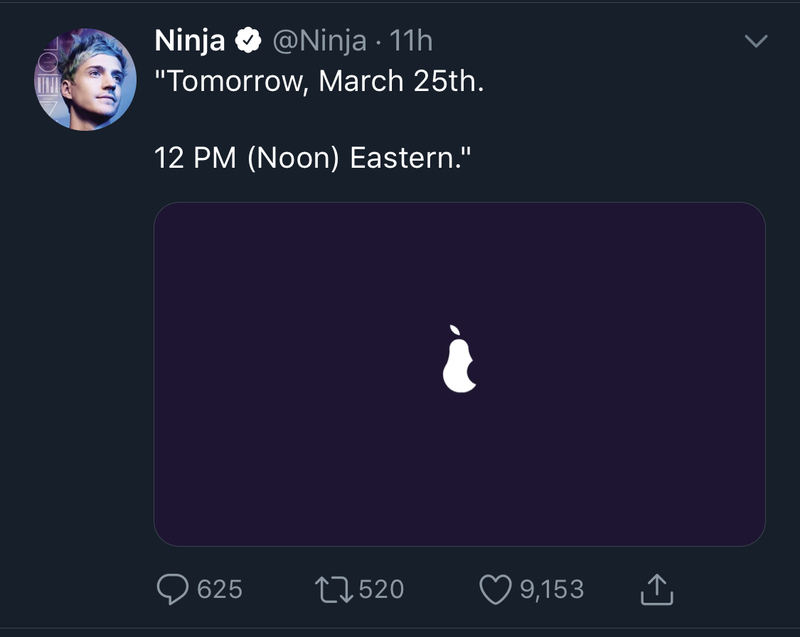 The tweet, which is incredibly vague, suggests that on Monday at noon (eastern), Ninja has something to reveal. The timing is slightly at conflict with Apple’s event, though, which isn’t scheduled to start until an hour later. More curious is Ninja’s lack of usual streaming this evening. After promising followers on Twitter that he’d stream tonight, he ducked out to “potato”. Perhaps he just wasn’t feeling it this evening, or maybe he’s busy getting a sneak peek at Apple’s gaming service. If the later is the case, the bid reveal tomorrow could simply be his presence at Apple Park. Perhaps we’re just trying to read tea leaves that don’t tell the story. It all seems a little too suspicious to ignore, especially given the rumors this weekend about Apple’s possible “Netflix for Games”. For now, we anxiously await seeing Apples next move, and how this wide-reaching services event plays out. It could be one heck of a show.